This is most probably one of the most dangerous stunts of all time especially for an advertisement. 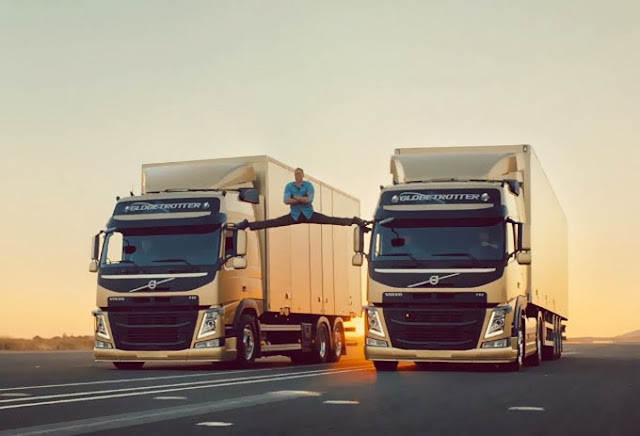 Van Damme's "Epic Split" was a roaring success in the online world. According to Anders Vilelmsson, the public relations manager for the Volvo Trucks - The stunt really happened and it just took one take to complete it. The video already got more than 39 million on YouTube and spreading like wildfire online. Volvo's main idea for the ad was to promote its new dynamic steering system in Volvo FM trucks. The video was shot in Ciudad Real, Spain in a closed-off airstrip. The Epic Split video is surely the perfect homage to the man who was a pop cultural icon for generations. Volvo's new steering wheels offer a more relaxed experience to truck drivers. The media landscape is changing for good and instead of the traditional TVC, Volvo decided to create Youtube videos to reach more people. It's also cost efficient to upload videos in Youtube. This video was performed under complete expert guidance. Van Damme did a great split at the age of 53. One shouldn’t try to do a split like this because it can be fatal. You need a great mental and physical strength to perform such activities and of course a great stunt team behind. It's a very dangerous thing and one should never try this to perform. If you haven't seen this ad, you should probably do it now. This ad showcases the mental and physical strength of a human being that consequently brings out the control, comfort and safety of the Volvo’s newest steering system. This Ad shines for its overall impact. The homage, the story and the message is just conveyed in the right spirit.